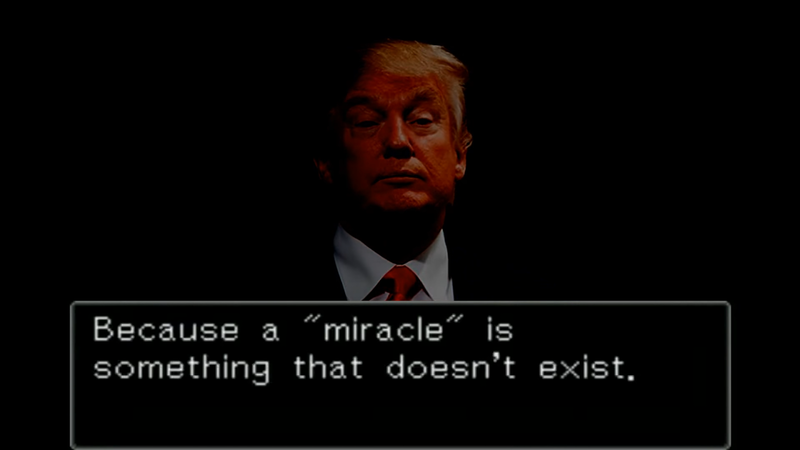 We planned in advance to have a Donald Trump version of the Phoenix Wright: Ace Attorney: Justice For All ending for Trump's inevitable defeat, and it was going to be a theme for the whole week. ...Well, we obviously didn't have any plans for what would happen if he actually won, but this is too good of a video to just never publish, so... Yeah. This will be my final post on the site. You'll never hear from me again so here I go. First, Hillary won the popular vote, so she is actually the president that the American people wanted. If it wasn't for the stupid outdated Electoral College system, she would be our leader. Second, Trump has for a while claimed that the election is rigged against him. What a bunch of bull****. He knew that it wasn't from the very beginning. 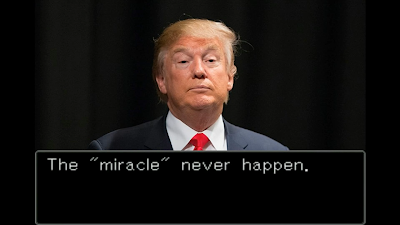 If you believe that Trump will accomplish anything that he had promised, then I have a bridge to sell you. All he did was fool gullible people like you to vote for him and you fell for it hook, line, and sinker. Lastly, I have learned just how many ignorant people there are in the country. I knew there were still bigots and racists, but I didn't know they comprised nearly half the electorate. It's days like these when I feel ashamed of being an American. All of the progress that we were making just all of a sudden has been reversed in a single day. The US will now be the biggest laughingstock in the world, and I'll be laughing along with them. Actually, due to all of the ridiculous reaction to Trump's victory, and because of Trump's victory, we're going to change our schedule of articles to address Trump's victory and what it means. ...Not that anyone but our staff knows what we're going to publish, so it's all smooth in front of the scenes. So you might not want to leave forever, but since you're Anonymous, I can't exactly go and find you and get you back. But it was nice having you. So you adapted the "expect the worse, hope for the best" kind of approach? Also I have a small desire to go on Squidboards and make the joke post of Less Popular Team strategy wins again (Clinton got the popular vote but Trump won by electoral) but I lost interest in going on that forum. ...Well, I made a comment, I guess. But very good connection. Full credit. And just like what happened in the Splatoon fandom, SJWs wants popularity to matter and abolish the Electoral College. Just like Nintendo wanted skill to be the most important part of Splatfest and not have people stockpile into a team just to be carried by popularity(in Japan, it was raised to 4x after Green Tanuki Round 1 won in skill but lost due to extreme popularity of the other team and 6x after Team Octopus won in skill but lost due to extreme popularity of the other team), the Founding Fathers wanted candidates to show their skill in getting individual states which may not be so populous to vote for them and not only focus on populous cities only. No offense to you, but the rest of the country doesn't want New York and California calling all of the shots. Although I'm glad that Hillary didn't win, I'm disappointed that a third party candidate did not reach the 5% threshold. As far as I know, the Libertarians are going to sue the CPD for not letting them into the debates. I think that it is only fair since we know how far off the polls actually were. Lastly, I just can't shake the feeling that the future will not be any better. With all of the division that's been taking place, I fear that the country is not going to heal from this election cycle. Until both the left and the right stop attacking each other and instead focus on compromises, nothing will make America great again, including Donald Trump. If I recall correctly, the Libertarians try to sue them every election cycle. It turns out that the polls gave the Libertarians and the Greens MORE support than they actually got! Then he did it again for 2016, and that got tossed out already. I am very concerned about all of the violence between the two factions of the country, and it's going to take a very strong, equal-handed enforcer of the laws (hopefully Trump) to solve it. Orrrrr we can just let states secede and self-govern. I'm fine with that too. Thank you for not putting up any articles on this new-found presidency. This is an incredibly controversial subject, especially for those not *truly* American, nor with the power to vote. Wait, what? What is this article, then?